There’s no shortage of stunning beaches in Australia. The whole coastline is surrounded by scenic stretches of sand. 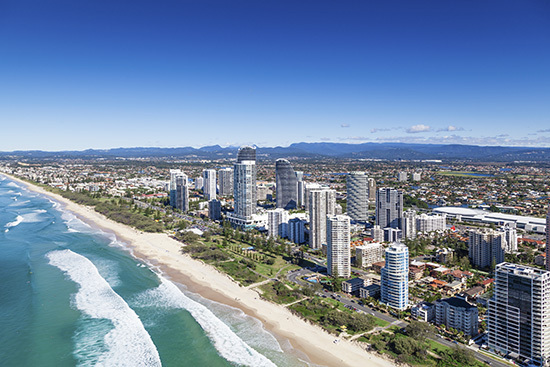 But for beaches that are not only beautiful but offer perfect weather and swimming conditions as well as a wide range of accommodation, restaurants and action, you can’t beat the Gold Coast. Located in Queensland, just an hour’s drive south of Brisbane, the Gold Coast is both bustling city and sleepy beach-side town in one. 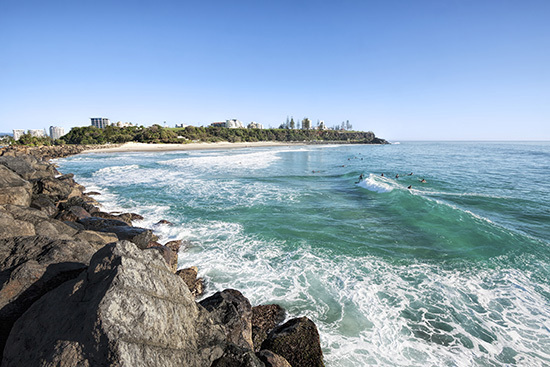 To the north you’ll find the high rises and action of Surfers Paradise, while in the south, beaches like Kirra and Coolangatta run at a slower pace, complete with retro corner stores and beach shacks. - All beaches are manned by surf lifesavers. To make their job easier everyone is instructed to swim between the red and yellow flags. If you do find yourself in trouble in the surf, stick your hand up and wave for help. - Between these flags you’ll also see a small coloured flag to indicate the swimming conditions. Green means gentle, yellow means swim with caution, and red means dangerous. - All beaches will have a surf club where you can enjoy a pint and fresh lunch at great prices. To eat at the surf club you must ‘sign in’ but you don’t need to be a member to do so. - Besides the popular stretch along Surfers Paradise and Main Beach, most beaches will offer free parking. Surfers Paradise may be the most famous beach on the Gold Coast, but Burleigh Heads would easily win the local title for best beach. Famed for its beach-side park featuring tall shady pine trees, Burleigh offers ideal swimming conditions while enjoying a beautiful view of the glittering tower blocks of Surfers Paradise in the distance. Top tip: The park by the beach has barbecue facilities, making it a great place to spend lunch after a swim. It’s about a 40-minute drive south of Surfers Paradise but, in my opinion, very much worth the drive. In fact after spending many of my summers growing up on various beaches at the Gold Coast, Rainbow Bay would have to be my favourite stretch of sand on the coast. Firstly, as a protected beach with a park on one side and rocks on the other, it offers ideal swimming conditions if you prefer to relax and float over waves rather than fight them. And secondly, it’s usually very quiet so you can enjoy a scenic swim with just a handful of locals. Top tip: Be sure to visit the surf club which is just beside the beach. The club is in a very old house building (and frequented by some Alf Stewart-types), but has a fantastic wraparound veranda where you can enjoy fish and chips while overlooking the beach. 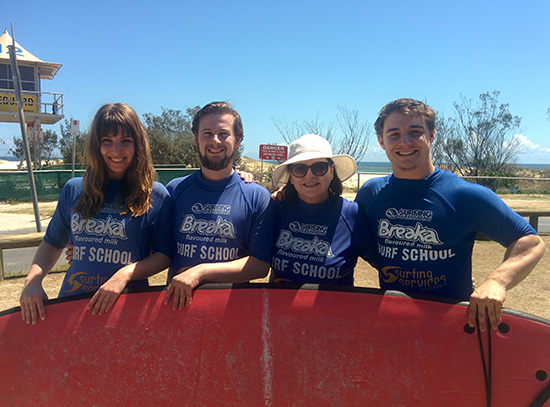 There are learn to surf schools all along the Gold Coast, but for a beach with ideal beginner waves and less people to bump into, I recommend Currumbin. 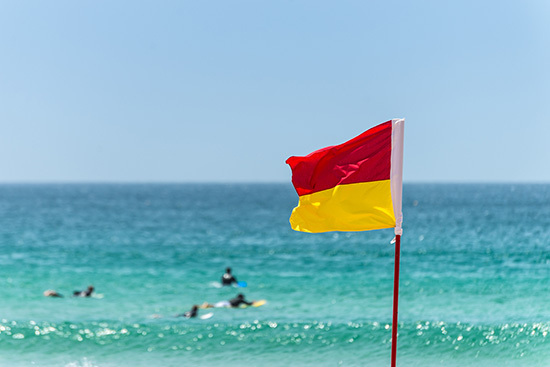 The beach by Currumbin Creek is perfect for beginners and it’s also patrolled – although you can’t surf between the flags, you’re encouraged to surf just outside of them. In fact I can personally vouch for it, having taken part in a 'learn to surf' lesson at Currumbin with my family a few years ago. Granted, I only managed to stand up on the board for a few seconds, but I had so much fun just getting to that point! Top tip: Whichever beach you choose, your Flight Centre Travel Expert can prearrange some surfing lessons for you, so you don't miss out. For a long stretch of sand as far as the eye can see, I recommend walking south from Surfers Paradise, all the way along Broadbeach to Mermaid Beach. All in the walk is around an hour long, but if you don’t want to walk back you can easily jump on a bus near Pacific Fair Shopping Centre to get back to Surfers Paradise. Located just around the bend from Rainbow Bay, Point Danger may have been named by Captain Cook because of its jutting cliff that proved dangerous for passing ships, but it’s actually very safe to visit. The point is the notable meeting area of the Queensland and New South Wales state lines and the site of the Captain Cook memorial and lighthouse. From here you can enjoy 180-degree views of the coastline in both states, as well as passing ships, whales, dolphins and very brave surfers. Top tip: The best time for whale watching on the Gold Coast is from June to October, when up to 15,000 whales migrate pass the coastline on their migration from Antarctica to Hervey Bay. While the south end of the Gold Coast is where you’ll find sleepy serene beaches, the north end is where you’ll find an array of action from theme parks to water sports. Much of this activity happens at Southport Spit – the 'Spit' being the section of sand that separates the broadwater to the ocean. Locally though, the aquatic area is simply known as just ‘The Spit'. 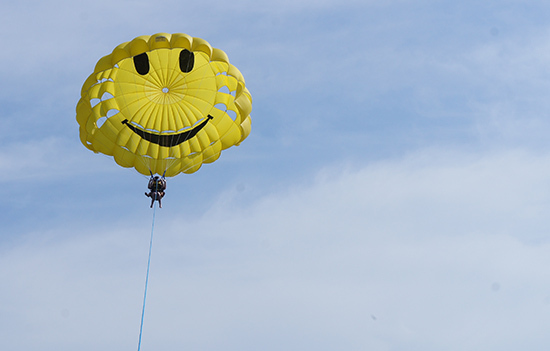 This area is where you’ll find many boats docked as well as a range of activities such as boat hire, parasailing, jet skiing and jet boarding. 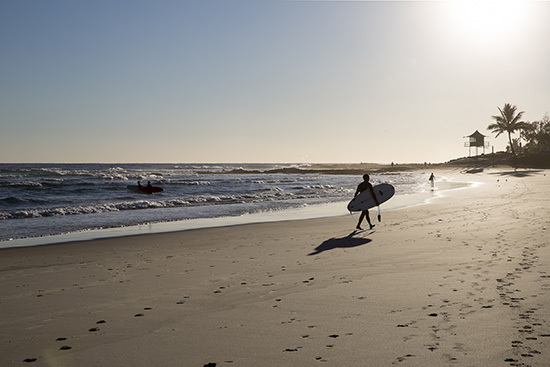 Experience these beaches and more for yourself with our Gold Coast holiday itineraries. These holidays can all be tailor made to suit you and can include extra experiences or accommodation options along the Gold Coast.